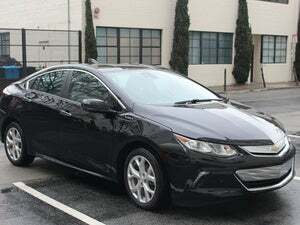 No other plug-in hybrid can touch the Volt's EV range. The next step is to look and feel normal enough to attract more buyers. The 2016 Chevy Volt could have offered its category-killing 53 miles of EV-only driving range and called it a day, but this plug-in hybrid electric vehicle (PHEV) wants more: more drivers, specifically, beyond its loyal but small following of green-car nerds. So it’s been completely redesigned to be more spacious and less geeky-looking, in hopes some mainstream users will give it a try. On a recent drive along the coast of Marin County, north of San Francisco, Calif., the Volt was ready to meet both challenges. The 2016 Chevrolet Volt has an EV-only range of 53 miles and a combined range of 420 miles including gas. Fifty-three miles on electric power alone. That’s a mic drop right there, given that other 2016 competitors are posting EV-only numbers of 17 (Audi A3 Sportback e-tron) to 35 miles (Toyota Prius Plug-in Hybrid, due in late 2016). Chevrolet showed off this talent nicely by taking us from Sausalito to Petaluma on Highway 1, passing oceans and grasslands in swift, silent electric-only miles. Every hybrid makes decisions about how to balance electric and gas power. In the Volt’s case, it uses up its EV range before moving on to gas. The total range of electric plus gas is 420 miles. That’s why PHEVs are attractive to drivers who love the idea of EV, but want the security of gas-engine backup. I know someone with an older Volt who can’t wait to buy this car, because it will cover his entire commute, round-trip, on EV miles. The 2016 Chevrolet Volt has an 18kWh battery nestled under the floor and the rear storage space. Chevy achieves this far greater range by squeezing an 18.4kWh lithium-ion battery into the 2016 Volt. The battery pack runs along the floor in the middle of the car, much like the drivetrain humps in traditional cars, and ends underneath the floor of the trunk. Thanks to advances in battery chemistry, the pack has 20 percent more storage capacity but saves 30 pounds over its predecessor. It’s still a heavy addition to the car, but Chevy uses that weight to lower the Volt’s center of gravity. We were encouraged to take the Highway 1 curves fast in the Volt, and I did. The car felt both stable and nimble. It also accelerated well on straightaways, which is not something you can say for every plug-in hybrid. Usually the more fuel economy it boasts, the less power and fun-to-drive-ness it delivers, but the Chevy Volt is turning that trend. Will it plug in Peoria? The 2016 Chevrolet Volt’s charge port is on the front driver’s side. Just push on the door to open. Here’s the tougher trick: Get more normal people into the Volt—people who couldn’t see themselves in the quirky-looking Toyota Prius, let alone a Nissan Leaf. For this audience, the 2016 Volt’s clever disguise as a compact sedan should make people feel more comfortable with going green. Where the original Volt design was chunky, the 2016 model is gently curved. There’s a little more passenger space inside, and the fit and finish don’t look like a plasticky ploy to save weight. The Volt is still going to cost more than a regular Chevrolet car, with a $33,170 starting MSRP. You’d need to get the full $7,500 federal rebate to bring it in line with Chevy’s next-most expensive passenger car, the bigger and more powerful Impala. We know the nerds will pay—the Volt is already the best-selling Chevrolet car in the tech-saturated San Francisco Bay Area. We don’t know what the newcomers will think, but the Volt is the strongest blend so far of green sensibilities and mainstream tastes. Chevrolet designed the 2016 Volt to look sleeker and fancier than its predecessor.